All of my favorite (unhealthy) things are combined in this recipe to make something magical: Bacon Ranch Bread (yes, you guessed correctly... my three favorite unhealthy foods are bacon, ranch, and bread!). But really, this recipe needs no further introduction... who doesn't love these things?! 1. Begin by slicing your bread in 1 inch sections, but do not slice through to the bottom of the bread - stop about a 1/2 inch from the bottom of the loaf. 2. 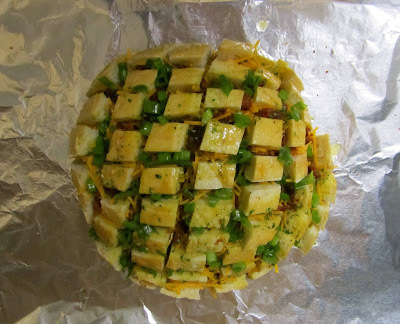 Next, stuff your bread with the shredded cheese, bacon, and green onions. Mix the melted butter and ranch dressing mix together and pour over the bread (melt more butter if you need to - this is already unhealthy... there's no going back now). 3. Finally, wrap the bread in tin foil and bake at 350 degrees for 30 minutes (or until the cheese is melted). If you like your bread crispier, put under the broiler for a few minutes. I totally agree with you - sinfully yummy!